The run has been extended for Hilary Mantel‘s Wolf Hall and Bring Up the Bodies which have been packing them in at London’s Aldwych Theatre. Mike Poulton’s dramatisation of the Tudor epic is now booking until October 4. The adaptations were commissioned by Playful Productions and brought to the stage by the Royal Shakespeare Company, working in collaboration with Playful. Directed by Jeremy Herrin, the productions have met with universal acclaim since opening at the Swan Theatre in Stratford–upon-Avon and transferring into the West End. 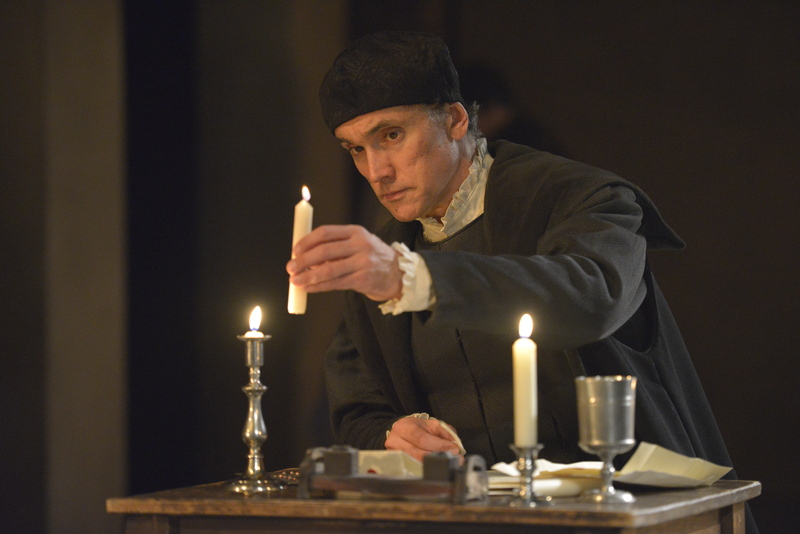 The two plays tell the compelling story of Thomas Cromwell’s rise from blacksmith’s boy to Henry VIII’s chief fixer and deliverer of the King’s chosen bedfellows. The cast includes Ben Miles as Cromwell, Nathaniel Parker as Henry VIII, Lydia Leonard as Anne Boleyn, Paul Jesson as Cardinal Wolsey and Lucy Briers as Katherine of Aragon. Wolf Hall won the Man Booker in 2009 and Bring Up the Bodies won in 2012, making Hilary Mantel the first woman ever to have received the award twice, and the first person to win the prize for two consecutive novels of the same series. She achieved another first recently when Bring Up the Bodies also won the Costa Novel Award, the first time the same novel has won both this and the Man Booker. The Mousetrap will run and run..around the UK!